Len Isitt with two monster salmon at Highbank 25 March 1996. Photograph, Len Isitt. The salmon in the foreground has entered the Highbank Powerstation tailrace and is unable to continue its final journey upstream to spawn. Salmon Salvage at Highbank. She was late arriving at the spawning grounds, the low ﬂow of the river had forced her to lay up in the great pool below the rapids in the Rangitata Gorge. She had been secure there, unmolested by fishermen, well camouﬂaged from poachers, the aerated waters providing oxygen and coolness. Occasionally, she would test the rapid ahead for a way up and through, but there was no urgency and she would resume her position deep in the waters where little energy was needed to survive. She was unaware that her forebears had had even greater difficulty with the barrier ahead until the New Zealand Army engineers had dynamited a great rock away. She had plenty of time to reﬂect on her journey so far, leaving the sea with the rising tide, taking care to avoid the silver ticers which plopped and ﬂashed through the surf, then running the gauntlet of lures and two spinners and scratching from both banks until gaining the sanctuary of the lagoon. She had not started her spawning run alone and some of the frantic struggles of her fellows made her all the more determined to keep her mouth closed. A volunteer with one of the big salmon salvaged from the Highbank Powerstation tailrace. The Rangitata River is the rockiest and swiftest of all the Canterbury rivers, with long stretches of fast, difficult water between resting places. 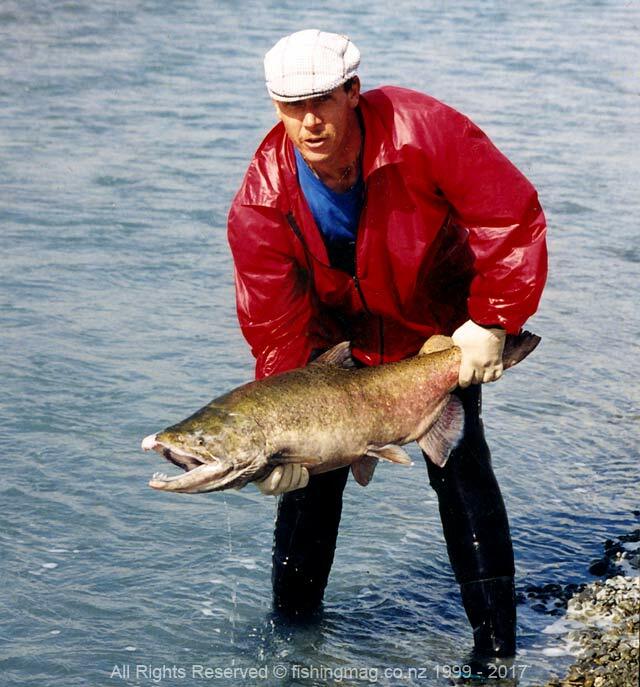 Prone to ﬂooding for long periods, the salmon who make it to the spawning beds are culled to the strongest and fittest. 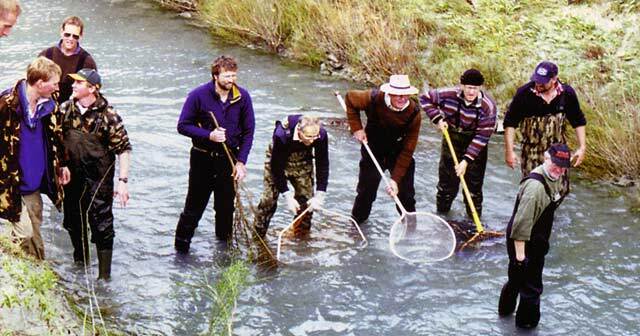 For many generations, Rangitata salmon are the biggest in Canterbury. In the great resting hole beneath the rapids other salmon also waited, tentative pairing taking place. The nor-west winds duly arrived with increased river flows, allowing her to complete her journey to her birthplace, Deep Creek, on Mesopotamia Station. This fine stable spawning stream, with its pea gravel, was already a mass of redds, but nature being wasteful allowed her to superimpose her own redd in a prime spot and in doing so, destroy the eyed ova from previous matings. Lying on her side, she burrowed a trench in the gravel and laid her roe while willing jacks fought for the right to ejaculate their milt over them. 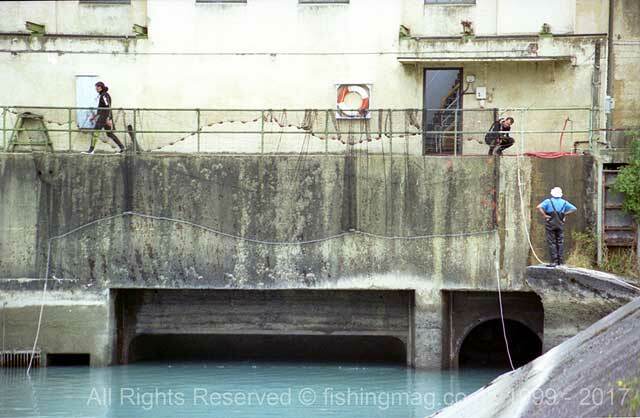 Salmon salvage begins by lowering the net down from the Highbank Powerstation wall. This will be used to contain the salmon into a small area where they can be caught individually with hand nets. Photograph, Allan Burgess. It would be nice to be able to say that all the adult fish lived happily ever after, but by mid-winter, all the adults would be dead, their emaciated bodies washed to the edges of the streams with their eyes eaten out by seagulls. A sad and sorry finish to such magnificent fish. Herding the salmon down the tailrace. From a salmon angling perspective, the milky waist-deep water was concealing a very large number of big fish. Apart from the odd fish attempting to scale the concrete dam wall, you wouldn’t know there were any salmon there. A surprisingly large number of salmon were found to be trapped in the tailrace. As many as several hundred fish were salvaged and returned to the Rakaia River to continue their journey to the spawning streams. 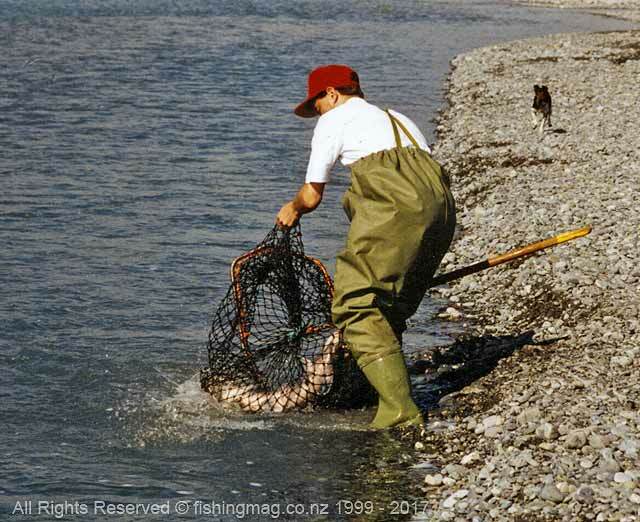 Ross Millichamp, green and black wet-suit, at that time the manager of North Canterbury Fish and Game, has an unhappy salmon customer by the tail as he transfers it to another net. Photograph, Allan Burgess. 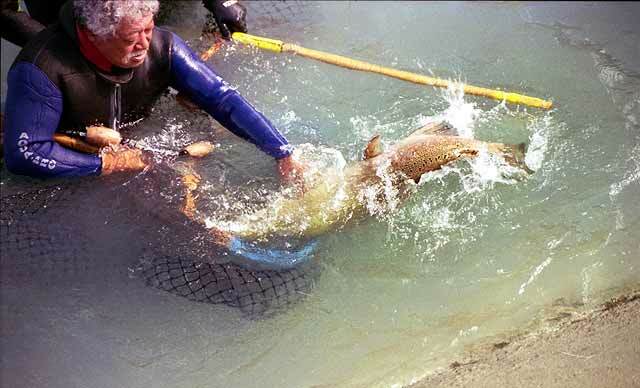 Capturing another big salmon in a hand net from the tailrace. Photograph, Allan Burgess. Her first recollections as an eyed ova were contentment, her nourishment came from her egg sac. In the early spring with warming temperatures, aquatic life increased in Deep Creek. Gradually, she began to feed and her body formed its recognisable fry shape. Instinctively she sought cover from larger creatures, knowing somehow that all waterfowl, trout, eels and frogs were her enemies. She swam and hunted in shoals dispersing and hiding at any hint of danger. Her kind was part of the food chain and her chances of survival were not great. But she was to be a survivor. The salmon were then lifted by a human chain up to the waiting tanker. Photograph, Allan Burgess. In the summer she left the sanctuary of Deep Creek and started a leisurely journey to the sea. Life was good and fun fossicking for food in the backwashes, and leaping from the water to catch ﬂying insects. Downstream, past Stew Point through the gorge, passing the great rapids that had delayed her mother she went. Lifting salmon up to the tanker. Allan Burgess wearing the dark blue cap. In mid-February, she had an experience which would save her life in the future. For some time she had been meeting mature salmon coming upstream on their spawning run and at Klondyke she was fascinated by a twinkling shining object flashing through the water, accompanied by a distinctive sound. It was nearly as big as she was and on impulse, she chased and grabbed it. A great barbed hook penetrated her mouth. Although she struggled desperately she was dragged to the river’s edge and lifted on to the shingle. The biggest thing she had ever seen picked her up in his wet hands, removed the hook from her mouth and returned her to the water. Three years later she was to see and hear many more zed spinners, but she would never again forget that experience. She passed the intake of the Rangitata Diversionary Race, a fantastic engineering venture which takes up to one-third of the Rangitata waters for irrigation to thousands of hectares of mid-Canterbury farmlands. It ﬂows mainly in open canals, with one exception, when it is piped in a great syphon. 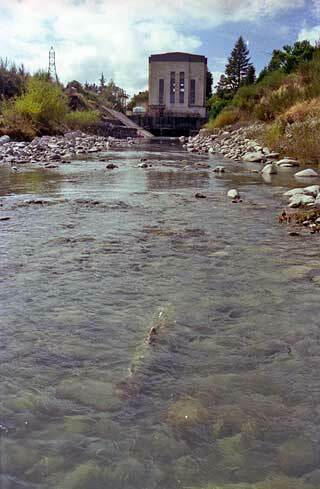 Surplus water, mainly in winter when irrigation is not required, is used in the Highbank power station, the water finishing in the Rakaia River. Some of her fellow fingerlings followed this race. They would all end up as food for seagulls on the border dyked paddocks. There were some very big salmon in the tailrace. Loading the tanker with salmon for the short trip back to the main channel of the Rakaia River. Eventually, she entered the sea. Her survival chances had improved since the Ngai Tahu took over the sea fishing. They had almost decimated the kahawai. This had the twofold effect of destroying her main predator and making the food normally eaten by kahawai available to her. Her growth rate was to be fantastic. 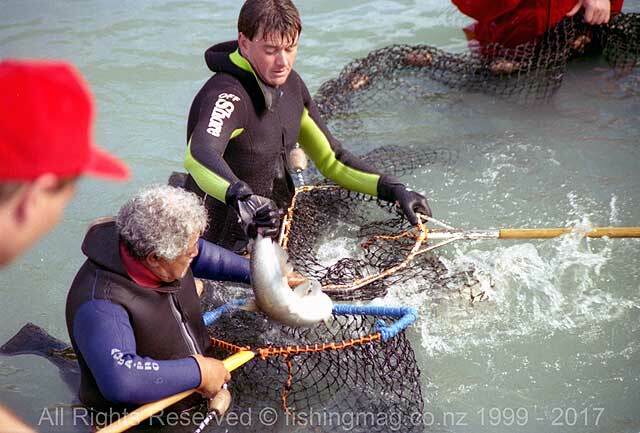 Some three years later she is off the Banks Peninsula coast when a Canterbury Angler’s Club member, Fred van Slooten, on a verification exercise on the 18 January 1996, is aboard the super trawler Resolution II. With the headline set low the trawl net passes under the shoal of salmon but still catches the red cod and barracouta below. She was now a magnificent fish, her body distended with eggs. 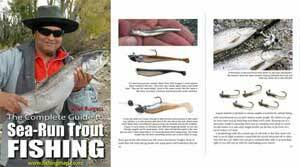 The urge to spawn irresistible, she sought and found the unmistakable smell of the waters from her birthplace, Deep Creek, and followed up the Rakaia River. Unbeknown to her a wet season mid-Canterbury had reduced the need for irrigation and the powers that be had opted to generate electric power with the surplus Rangitata water for the National Grid. This in spite of plentiful lake storage in Tekapo, Pukaki and Taupo. Many hundreds of salmon made the same error and congregated in the tailrace of Highbank Power Station. 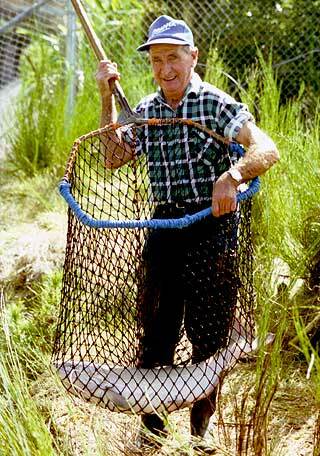 Len Issit wearing the white hat passes up another salmon during the salvage operation. When a call for help in salvaging was received, two Canterbury Angler’s Club members were able to help. They found jackfish of up to 40 lbs stranded and dead and many fish still alive, but with great scars on their bodies where they had leapt again and again against the concrete walls of the powerhouse. 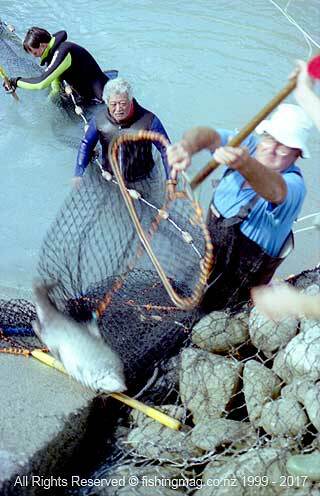 Large nets were used to encircle the stranded salmon. Len Isitt, standing in water up to his waist scooped our female fish up in a hand-held net. She thrashed in the net, showering water over the already wet workers. Other Dad’s Army helpers formed a chain which passed the net up to the bank to a waiting oxygenised fish tank where Kevin Lynch emptied the salmon into the tank. 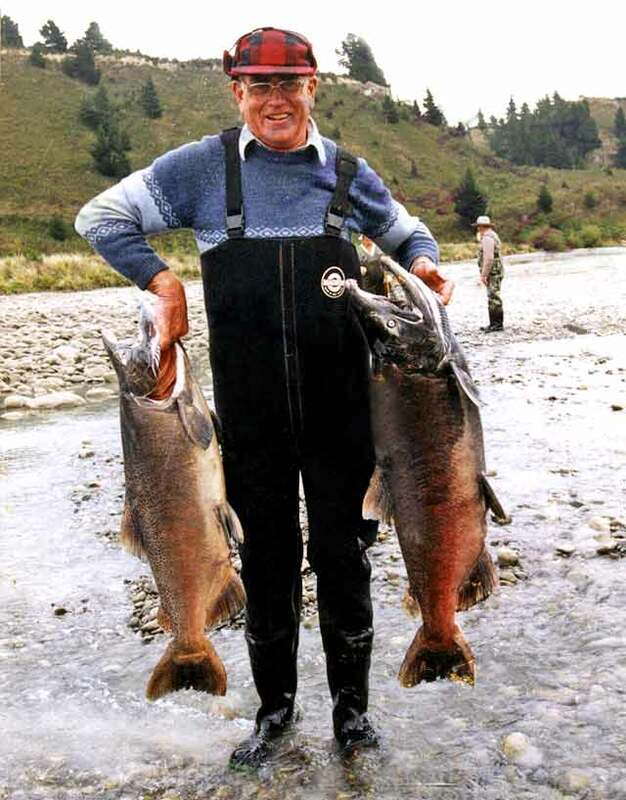 With 15 fish aboard he then rode in the Toyota 4 Wheel Drive vehicle to the Rakaia River above the Highbank tailrace, where Kevin netted and carefully released this wonderful fish. She was one of 260 salmon salvaged that day. We would like to think that she has made it safely to a fine spawning area up the Rakaia River, mated with a Rakaia jack and the X breeding of the Rakaia and Rangitata salmon will ensure an even finer progeny for the future. 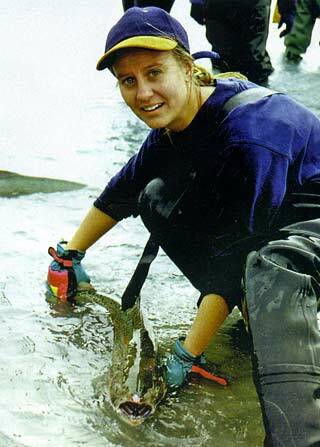 A volunteer about to release a big Chinook salmon jackfish. It was saved from the Highbank Power Station tailrace and returned to the Rakaia River in the hope that it might continue upstream to the headwaters to breed. Releasing one of the salvaged Highbank salmon back into the Rakaia River. Photograph, Allan Burgess. When a silver salmon turns from the freedom of the seas into the narrow mouth of a snow-fed South Island river, it bent on its own destruction. But when at the tail end of the season hundreds of these magnificent creatures are trapped in the tail-race of a man-made power station, their instinctive rush for inland spawning grounds is tragically thwarted. 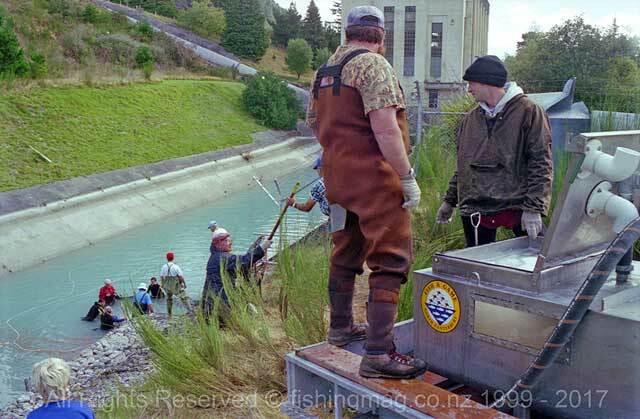 Brian Ross, a ranger for Fish and Game North Canterbury which co-ordinated the recent rescue of stranded fish from the Highbank power station tailrace, says it’s not only the false trail laid by irrigation water which is a threat to the survival of breeding fish. Further up the Highbank tailrace volunteers net some escapees. 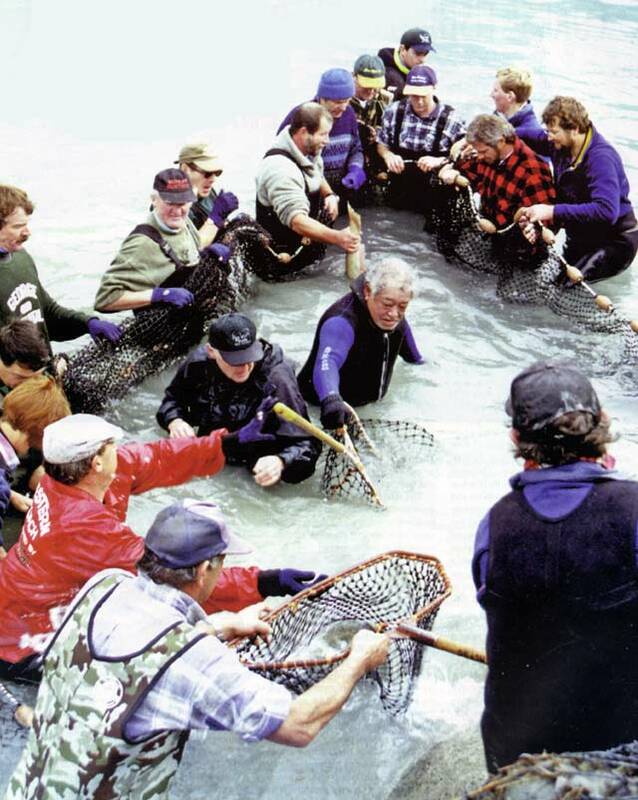 For the 318 salmon successfully moved into the mainstream of the Rakaia River during a five-hour operation, there were probably nearly as many volunteer conservationists and fisherpeople determined to preserve the resource. 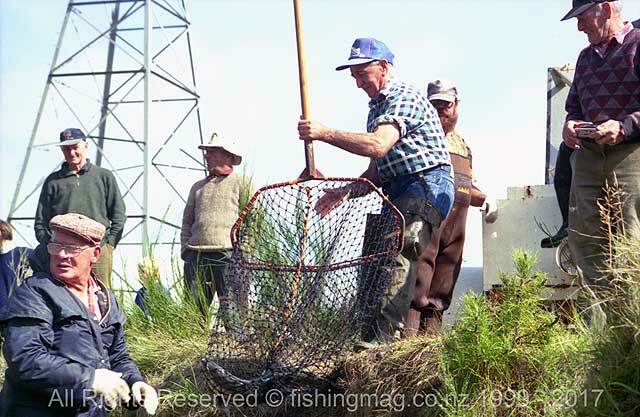 Those who braved the cold waters of the tailrace to drag nets to the rescue point were the first to discover evidence of nefarious poaching activity over recent weeks. Lengths of line attached to heavy ticers, treble-hooked at both ends, spoke volumes about the difference between sportsmen and poachers. Mr Ross is almost certain the salmon which end up at the Highbank tailrace are salmon which should be in the Rangitata River, some 70km cross-country. Water from the Rangitata is diverted to irrigate farms between the Rangitata and the Rakaia Rivers. Surplus water is used to generate power at Highbank, but the run-off means that Rangitata water enters the Rakaia, enticing the salmon up the wrong river mouth. Shiree Cunliffe of Ashburton was one of the rescuers. 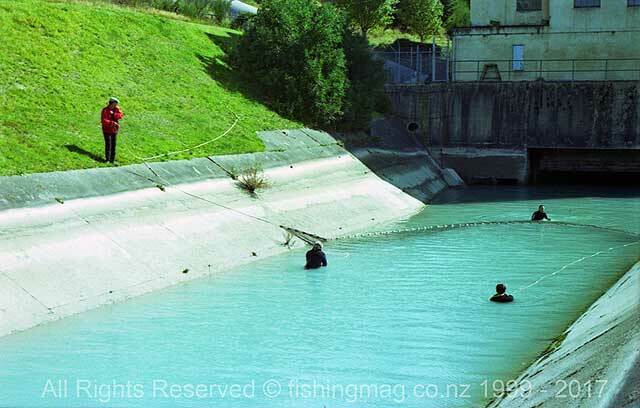 The fine-tuning of their instinct to recognise their own waters means that they turn away from the Rakaia at Highbank, and head up the tailrace until they hit the dead-end of the power station. There, they stay, until either death or human intervention. Last year, a similar rescue operation was carried out on three separate occasions, with up to 1000 fish moved back into the Rakaia. Mr Ross says that in dry summers there is not so obvious a problem as in the last two seasons when there has been surplus irrigation water. One answer to the strandings, a barrier at the end of the tailrace, has been ruled out in the past because of difficulties associated with maintenance. Mr Ross says the real concern now is what will happen now that the Highbank power station is up for sale. “We’ve got to save these salmon somehow. It’s imperative that this issue gets sorted out before any sale is agreed.” This year, a system using a winch and overhead cable was tried but abandoned because the fish were out of water for up to four minutes. 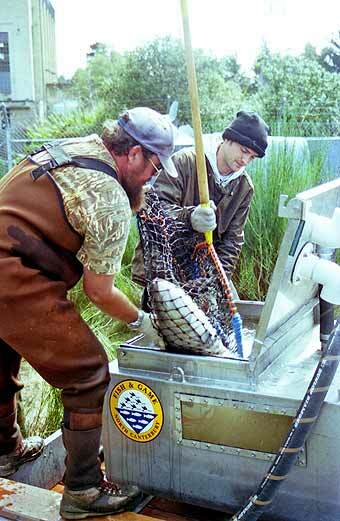 Moving these salmon is no easy task, and there is always concern about stress levels. Rescuers reverted to the old method of netting and passing salmon via a human chain to oxygenated tanks which were then driven to the mainstream. Modifications to the winch system are expected to provide a better solution in the future. Honorary rangers, Central South Island Fish and Game personnel, volunteers from the NZ Salmon Anglers Association and Rakaia Fishing Promotions, and members of the public all contributed to the rescue mission. “The fish are stressed, but for as short a time as possible. We can’t do any better than try to save them, and a cool day is a help,” says Mr Ross. For the rescuers at Highbank, the thought of those saved completing the spawning cycle was very rewarding, as they watched the salmon exuberantly speeding off into the Rakaia current. 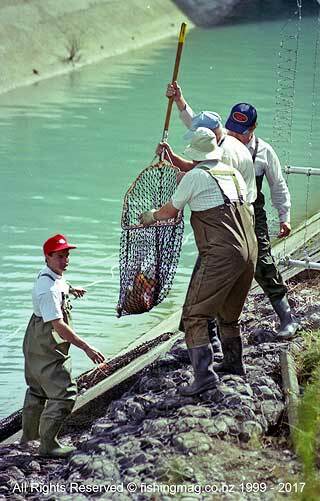 The team in the Highbank tailrace – waders essential.